Welcome back aboard the lore train, ladies and gentlemen. Last week, we dropped a pretty heavy bombardment of juicy fiction-focused topics. As you’ll quickly notice, this week will be a much lighter and stealthier affair – though hopefully no less enjoyable. The studio is hard at work on a myriad of fronts, stoking the fires of forges both known and unknown – some far flung in the future, and some far closer than you think. This week we thought we’d offer a peculiar peek into the backstory of the Jiralhanae – well, one in particular. Though many of you have no doubt encountered him many times, you’ve never known his name. Until today that is. Let’s go ahead and dive in, shall we? Cethegus had always known his time would come. For over a decade he had led his pack with fervent conviction and fierce renown. Cethegus had climbed the ranks of Jiralhanae society armed with a deadly mixture of cunning and bloodlust. 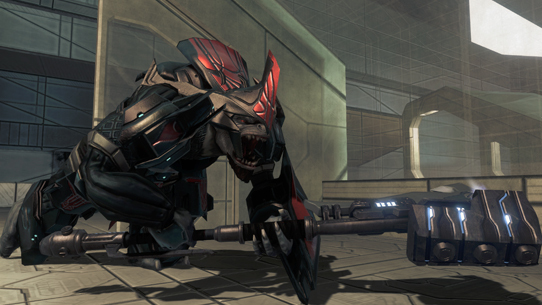 He’d outwitted Kig-Yar mercenaries and liberated the ridiculous mandibles from many a Sangheili’s skull. He’d slaughtered scores of humans across countless systems during the relentless march of the Covenant. He’d served the Prophets and honored the Path, but still one thing remained elusive to him: Opportunity. 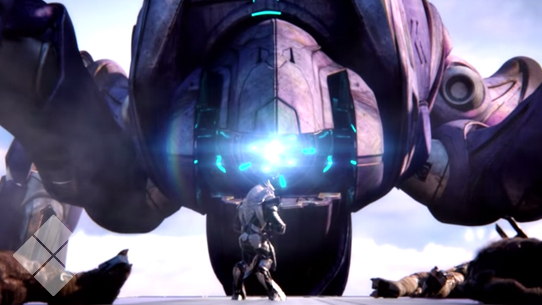 That all changed however, within what seemed like fleeting moments; Tartarus – the self-proclaimed turned Prophet-ordained Chieftain of the Brutes – had fallen in battle, cut down by the traitorous Sangheili Arbiter and the indefatigable human Demon at the site of the Sacred Ring. Tarturus’ demise had left a power vacuum amidst a perfect storm; the natural progression of catalyst and consequence quickly accelerating as the Covenant neared the rapidly approaching threshold of the Great Journey. Surrounded by his loyal flight-fighters, Cethegus drew fortitude from their frenzy and activated his holy hammer. To take Tartarus’ place at the right-hand of Truth, he need only do one thing. Finish this fight. RestlessPack79: Is the Elite Assault harness in halo 3 and the Elite Ranger harness in halo 2, one and the same? 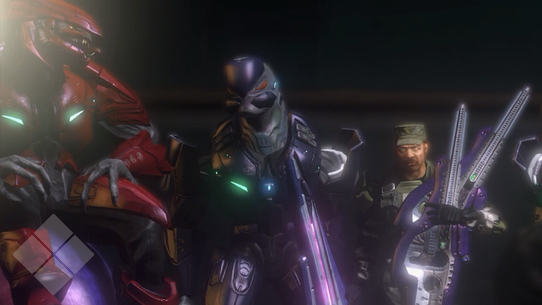 A: In many ways, the Sangheili Ranger harness is effectively a highly specialized example of the more ubiquitously encountered – and labeled – Assault harness. And while the EVA-centric Ranger patterns shares many different aspects of its functionality and construction with the Assault harness, they are still for all practical purposes distinct systems. 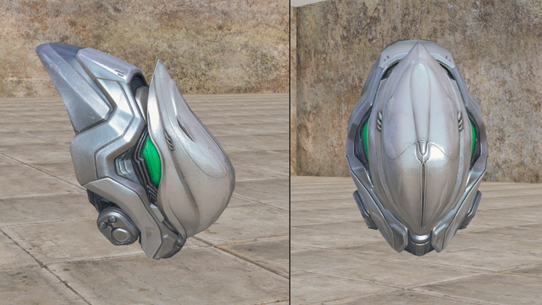 As a special treat, we’ve included a development render of the final model used for the Ranger helmet in Halo 2: Anniversary. If you want a fun fiction quest to embark on, compare the helmet design here with the variant Ranger harnesses used in Halo 4, Halo 5: Guardians, and especially Halo: Reach. There’s some very cool common design language and features throughout the various patterns that help tie them all together in fun and interesting ways. And that will do it for this issue. On a bit of a housekeeping note, you’ll notice the number of weekly “full” Universe encyclopedia entries be reduced for a spell while spool up energies in other exciting directions. However along with this, we’ll actually also be increasing the frequency of some of our “Deep Links” features to be a bit more often than originally planned to help tide you over and sate your ravenous cravings. 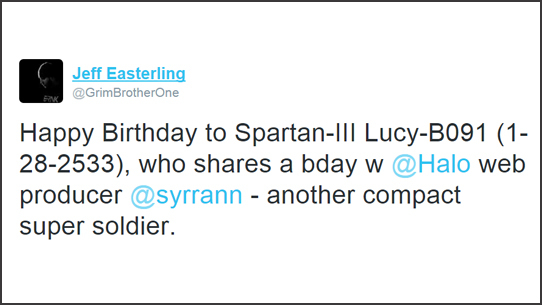 Also, in case you missed it, yesterday yours truly hit up the Twitterverse with a special Happy Birthday message to Spartan-III Lucy-B091 – not just special because it’s Lucy, but special because it’s the first time we’ve published her birthday: January 28, 2533. You never know where the canon might creep up on you! Before we close, a bit of weekend viewing advice: make sure you keep an eye on the Halo World Championship stream from X Games Aspen 2016. I hear it’s a pretty cool event that doesn’t afraid of anything. Just saying. 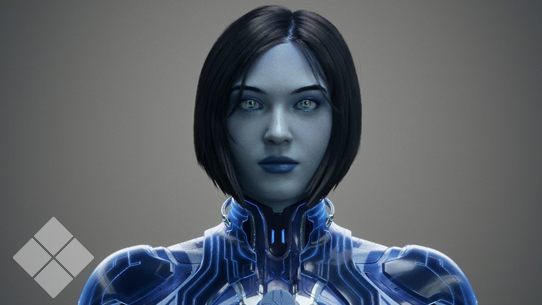 Until next week… Live well, play Halo, and when in doubt, always trust your instincts.